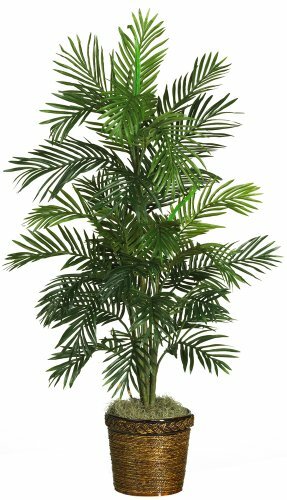 One of the finest silk palm trees we offer, this six and a half foot Golden Cane Palm tree will have you feeling like you are always on vacation. Standing a full 78" high, the multiple trunks sport 333 palm leaves, just waiting to dance in the warm tropical breezes. 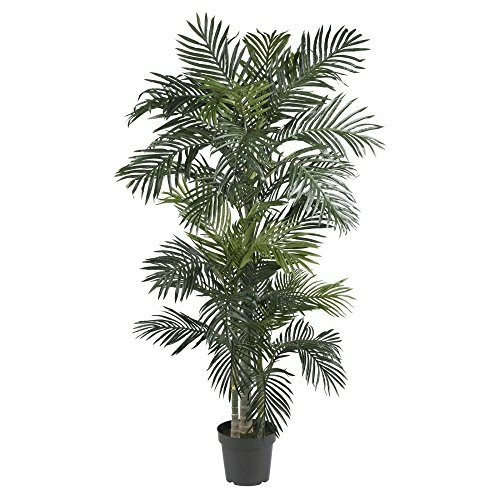 Perfect for any room or office decor, this majestic palm tree will create a sunny atmosphere wherever you place it. Dimensions: 45W x 40D x 78H in.. Natural-looking silk leaves. Arranged in black plastic pot. 3 trunks support 333 palms. Dimensions: 45W x 40D x 78H in. Let's bring the tropics to you, and make it "sunny" in your home or office no matter what the weather is outside. This elegant golden Cane Palm tree stands 4' high, with two separate trunks bursting forth with hundreds of palm leaves. It looks so real, you'll be searching for the X that marks buried pirate treasure. Ideal for any decor, and also makes a perfect gift. Choose from available sizes. Natural-looking silk leaves. Arranged in black plastic pot. 2 trunks support hundreds of leaves. 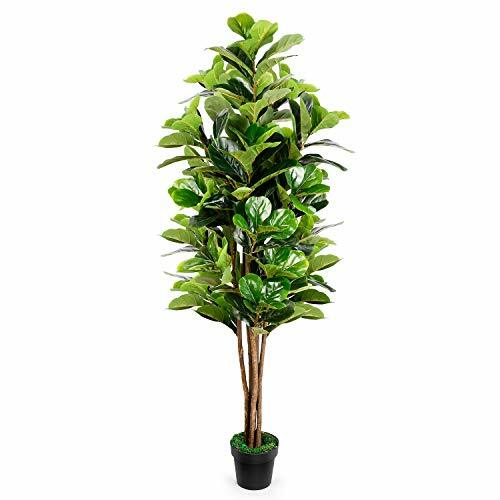 Stately and unique, the Ficus tree is one of most interesting trees around, and will make the perfect complement to any home or office decor. The twisting trunks reach skyward, and suddenly burst into an explosion of green. With 378 leaves, this tree will fool even the smartest of birds, so watch for nests when you dust! Comes in a black pot with faux soil. Choose from available sizes. Crafted with silk leaves and natural wood trunk. Arranged in black plastic pot. Hundreds of textured leaves. Heat up any dull space with this lovely Asian goddess. 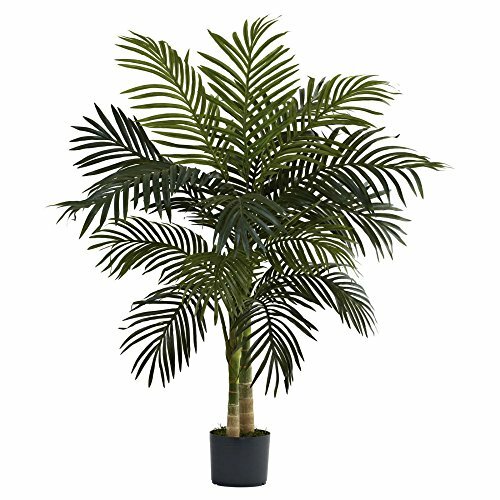 Straight from the tropics, this exotic silk Areca palm makes a great conversation piece. Standing 56 Inch tall, it's sure to demand the attention of all who enter the room. Slender wispy alternating leaves cover each carefully crafted stem. A stylish wicker basket filled with artificial moss is all the attention this breathtaking tree requires. The Cedar Pine is renowned for its gentle beauty that lasts the entire year. It's also a very versatile plant in terms of look - equally at home in a summer garden, a rustic den, or a snowy backyard. And our 4' tall Mini Cedar Pine Tree perfectly captures the essence of the real thing, without the care a live tree needs. Boasting 1,000 tips, this elegant tree will enhance any d cor and also makes an ideal gift. 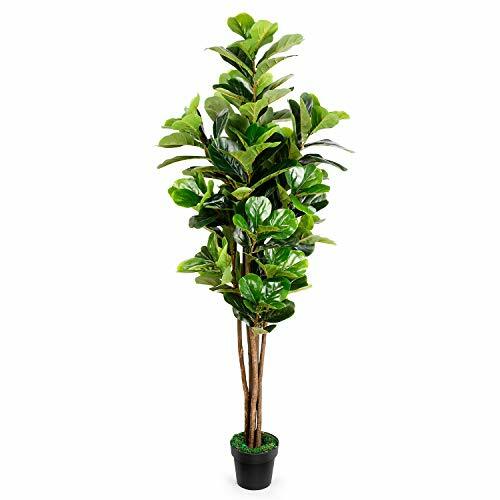 Rising high and finishing in an explosion of leaves, this 72" fiddle leaf fig tree is the perfect way to bring the forest indoors, without worrying about sunlight or watering. It's an impressive offering, standing six feet tall, and is ideal for a home library, den, man-cave, or (of course) an office. Complete with 270 leaves, several trunks and a planter pot, this also makes an ideal gift. Dimensions: 26W x 26D x 72H in.. Crafted with silk leaves and natural wood trunk. Arranged in black plastic pot. Multiple trunks support 270 large leaves. Dimensions: 26W x 26D x 72H in. 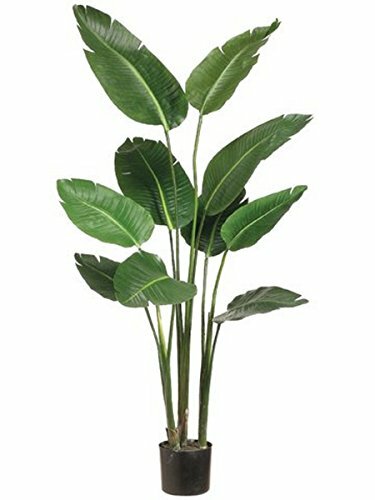 You are buying One of The Very Best Quality 5 foot Tall Artificial Silk Bird of Paradise Palm Tree Potted Plant. This artificial palm tree is made of silk. The artificial bird of paradise tree comes in a weighted, durable container that measures 6.5 inches tall, 6 inches across the top, and 6.5 inches across the bottom. The height is from the bottom of the pot to the top of the tree. You need to arrange the branch and leaves with patience.It will looks more Beautiful. It can be gift for family and friends. It's about 7" tall ; width diameter is about 6.3"
Great design, Green crystal comes from Money Tree for wealth Luck. 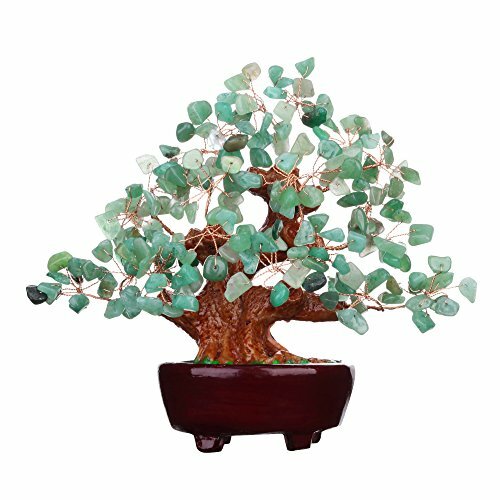 The Chinese Letter on the Money Tree is " Choi" means "Wealth" "Luck"
Crystal Money Tree is a powerful tree of abundance. It will help you attract wealth and prosperity, success, and all good things. Place it in their living room to bring you money luck. 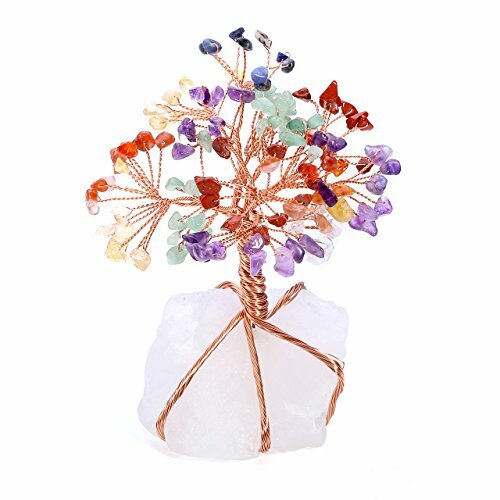 Great design, aventurine quartz crystal comes from Money Tree for wealth Luck. 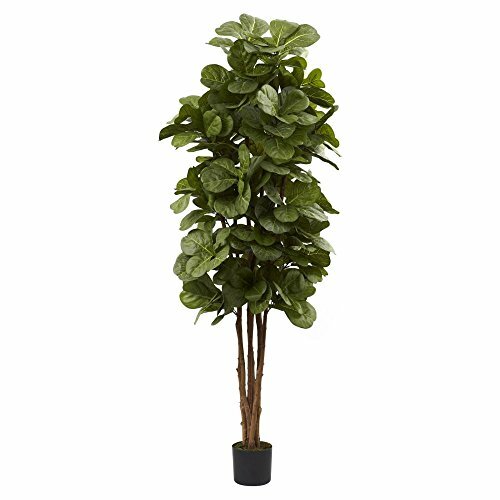 Rising high and finishing in an explosion of leaves, this 72" fiddle leaf fig tree is the perfect way to bring the forest indoors, without worrying about sunlight or watering. It's an impressive offering, standing six feet tall, and is ideal for a home library, den, man-cave, or (of course) an office. Complete with 270 leaves, several trunks and a planter pot, this also makes an ideal gift. 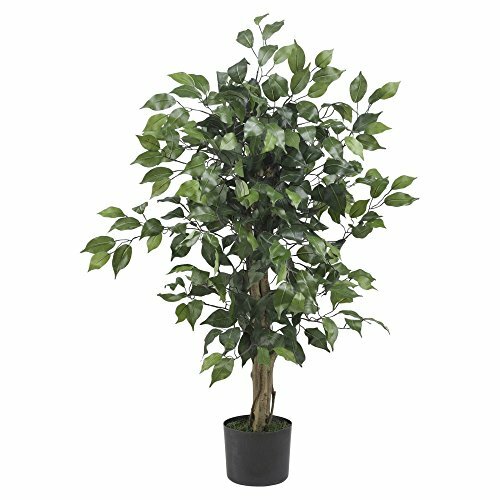  Total height is 6 feet, 232 large Fiddle Leaf ensure overall lush.